Creeper is a teenager living on the streets of an alternate 1880’s New Orleans, often spending time near Les Grand Murs, the huge wall used as a airship dock in this world’s version of the Big Easy. Creeper has big dreams of being crew on one of those big airships, but to get a chance at that, Creeper is going to have to help the captain of one of those airships stop a plot to unleash a devastating weather weapon designed by a Haitian scientist and coveted by the Union, Confederacy and everyone else. 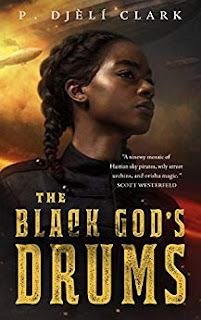 Welcome to the world of P Djeli Clark’s The Black God’s Drums. Creeper makes for an appealing and strong protagonist. The book doesn’t really feel like YA story to me although it has some traditional elements of that. The youth of the character, the coming of age story, the relatively breezy pace, and the general tone do earmark it in that direction. There is plenty here for readers of all ages to sympathize and identify with her, as she learns to really understand her connection to the orisha, Oya, and her own other talents besides. Captain Ann-Marie, of the Midnight Robber, is every inch the steampunk airship captain that can and does serve as an exemplar and a role model for Creeper, and a character with her own agency in her own right. I wouldn’t mind a novella from *her* point of view. That said, I found the world depicted here to be an intriguing one, and if that sequel hook in this novella does pan out, the promise of this first novella can be completely fulfilled in a subsequent, and hopefully more substantial work. Bonuses : +1 for a stunning and immersive alternate world with a ton of potential.